Purchasing a bath pillow can turn your bath time into a truly relaxing, spa-like experience without the high cost of a real spa. You will be able to relax right in the privacy of your own bathroom while you sip a glass of wine and enjoy fragrant bubbles and aromatic candles. The best bath pillow is one that has good suction to stay in place, quick drying material and plenty of support for your head and neck. Our pick, IndulgeMe Luxurious Bath Pillow, is made from double thick foam that is durable, supportive and strong. Trying to relax in the bath when all you have to lean on is cold porcelain or you are leaning back with your neck at a weird angle takes away from the soothing, comfortable experience you are after. Once you have leaned back in a tub full of warm water and bubble and rested your head and neck on the perfect bath pillow, you will never want to go back to taking baths without one. Bath pillows come in tons of different styles, shapes, sizes and materials. They also have numerous features such as being scented, bath pillows that can provide massaging action and even some that play music. With so many wonderful choices available it can be overwhelming to figure out which is the best one for your preferences. Choosing the right bath pillow is a part of this whole relaxing bath experience. There are several things that you can look at when you are researching all the different types that are available. Ultimately, choosing the perfect bath pillow for your baths is mostly personal preference. This guide will help you discover what those considerations are and how to use the information in this guide to make the decision making process much easier. The Harrison House bath pillow features two large-sized suction cups that help keep it from sliding around and becoming a nuisance during your bath. The lightweight, supportive pillow is contoured and soft, cradling your back, head and neck in luxurious comfort. The anti-bacterial mesh allows air and water to flow through the pillow easily, allowing it to dry quickly and avoid mold or mildew. The Cloud Nine Company created this pillow to stand up to daily use and last years. It doesn’t rip and tear like other bath pillows can do. With the proper care, this bath pillow can last years, providing you with the most relaxing, luxurious bath you can have. There is a 10 year, no questions asked warrant on this product. If you are not 100% ecstatic with your purchase, they will happily refund your money. If you want to purchase something that is long lasting, comfortable and luxurious too, the Harrison House bath pillow is the way to go. Kleeger has produced a comfortable and relaxing bath pillow that focuses on providing you with a bath time experience you will look forward to often. It is lightweight, supportive and soft. The contoured shape gives your back, head and neck all the support it needs to maintain your comfort level every time you take a bath. The extra large suction cups that this Kleeger non-slip bath pillow features will ensure that the pillow stays where it is supposed to so your head isn’t sliding around. The contoured shape is comfortable and cradles your head and neck in comfort. The mesh material that the Kleeger bath pillow is made from is anti-bacterial and resists mildew and mold. The pillow dries fast when not in use so it is ready for you again whenever you want to take a bath. To keep your bath pillow clean and healthy, clean it once every two weeks. All you have to do soak it for at least 15 minutes in soapy, anti-bacterial water. Wash it gently by hand and then rinse. Don’t scrub too hard so the mesh isn’t damaged. Allow the bath pillow to dry thoroughly outside of the bathroom and then you can put it back in the tub. The Kleeger bath pillow comes with a 5 year warranty. If you are not 100% satisfied, they will give you your money back, no questions asked. 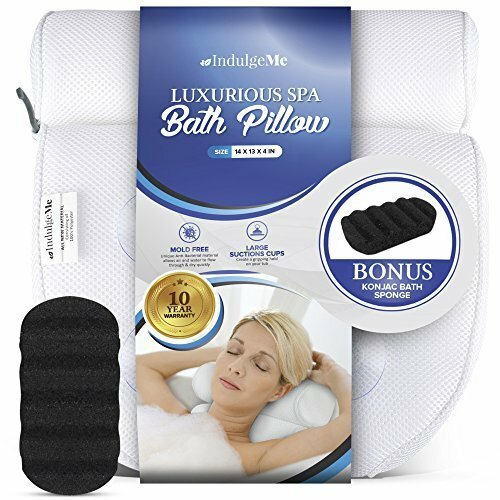 The double foam that this Epica Luxury Spa Bath Pillow is made from provides the perfect foundation for a luxurious, relaxing bath that will help all your stresses melt away. 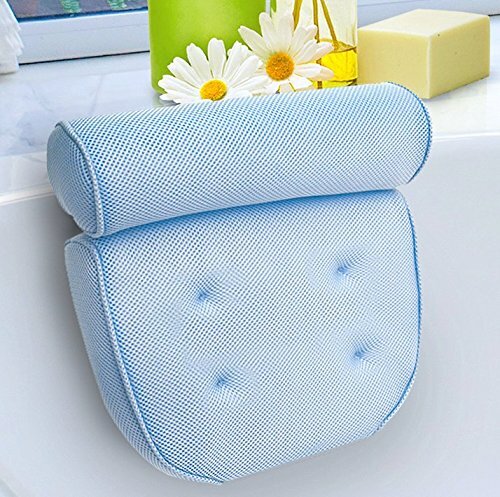 This bath pillow has strong suction cups that are larger than most bath pillow suction cups. They are designed to keep your bath pillow securely in place so your head is positioned the way you want it. 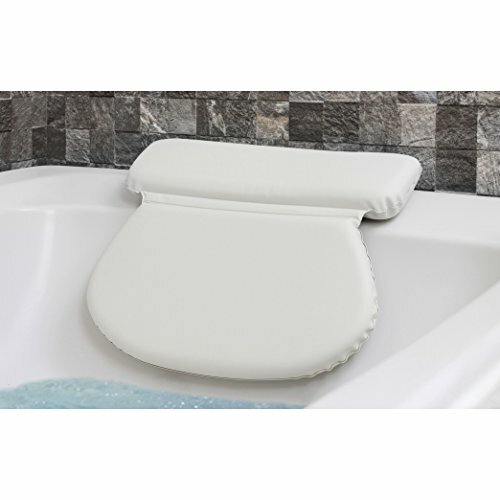 Epica’s luxury spa bath pillow is perfect for any one and fits in any size tub or Jacuzzi. The two-panel style folds over the side of the tub, providing you with cradled comfort for your neck, head and shoulders. The hinge is flexible and adapts to kind of tub including Jacuzzis, roman tubs, claw foot tubs and air-jetted tubs. This bath pillow from Epica provides you with double the foam for the ultimate in comfort. It will last for years due to the fact that it is durable and strong. The exterior and interior dries quickly so you can use it every day without worry of mildew or mold. Removing the bath pillow from the side of the tub is quick and easy, just slide the pillow up and off the tub and you’re all set. The Epica bath pillow comes with a 10 year comfort guarantee. If you are not completely satisfied, the company will give refund your money. Please note that the Epica bath pillow does not grip onto surfaces that are textured very well and may not stay in place. A warm bubble bath after a long, tiring day is something to look forward to. Bath pillows are pillows designed to make this time even more comfortable and relaxing. With so many different choices, it is possible for everyone to find a bath pillow that works well for them and provides everything they are looking for. We have suggested three different types of bath pillows that are made from high quality materials. These pillows are designed to be comfortable, secure, easy to keep mold and mildew-free and are not expensive either. If these three top rated bath pillows are not quite what you were looking for, read our buyer’s guide below. It is filled with information that will help you discover the different types of bath pillows and the features they have. This knowledge will help you understand what to look for when you are researching the different styles so you can make an informed decision on a bath pillow that will give you the kind of luxurious and relaxing baths you’ve always wanted. There are many reasons to purchase a bath pillow. We have listed these reasons below. These benefits are all excellent reasons that will benefit you in ways you never imagined. Helps you relax – relaxing isn’t as easy as it used to be in today’s busy world. Rushing around to get to work, taking care of the kids and pets, taking care of the household and other responsibilities make relaxing something that people have almost forgotten how to do. Attaching a luxury bath pillow to the edge of your tub, filling the bath with scented bath bombs, lighting candles and putting on music can provide you with one of the most relaxing times you can imagine. Relaxing is good for your health. Gets rid of stress – Stress is a major contributing factor in many health problems. It may sound simple, but taking a relaxing bath can have profound effects on reducing the stress in your life. The surroundings and comfort of your bath will enable you to let go of the day’s stresses for a short time so you can clear your head for awhile. Helps relieve muscle soreness – A warm bath of Epson salts combined with the perfect bath pillow can get rid of tired aching muscles from working out, work at your job or stress. The bath pillow will support your head, neck and back properly so any soreness can seep away. Leaning against the cold porcelain won’t provide this soothing comfort for you. There are several things you will need to take into consideration when you are looking for the right bath pillow for your needs and preferences. All of these factors will help you make a decision when purchasing a bath pillow that will be exactly what you are looking for. We have listed these considerations below. How big should your bath pillow be? – This will be determined by a number of things. How big is the lip of your tub? If there is a small lip you will want to choose a smaller bath pillow that fits well. Some models even fold for easier use. If the lip at the top of your tub is much larger, look for a bath pillow that offers plenty of support that doesn’t require you to have your neck back uncomfortably. Quality of materials and construction – When you purchase a bath pillow you want it to last longer than a few months. This is regardless of whether you choose an inflatable bath pillow or one that is cushioned. Research the company if you are unfamiliar with it to ensure that they have a good reputation and guarantees or warranties on their products. Also check customer reviews to see what they have to say about the quality of the pillow. Quality materials are going to ensure that the pillow lasts a long time, even with frequent use. How many suction cups is enough? – In general, the more suction cups the pillow has, the sturdier and more stable the bath pillow will be. Those with 4 or more suction cups will stick to the surface of the tub better than one with just two. Don’t consider bath pillows with fewer than three suction cups and make sure that the suctions cups are of good quality. Larger suction cups tend to work better at keeping the pillow in place than small ones do. What kind of material do you prefer? – Some people prefer a vinyl bath pillow because it is easier to keep clean. This is a true statement, but many feel that vinyl pillows are not as comfortable as those with terry cloth material or soft mesh material. Terry cloth bath pillows require more care and maintenance to ensure that no mildew or mold grows but the maintenance and care are not complicated. Deciding on a shape – There are several different shapes available in bath pillows. You can choose a solid, one piece design or a multi-panel design. Bath pillows can come in shell shapes, round, part rectangular/part round and other shapes as well. Which shape you choose is personal preference and doesn’t affect how well it works unless you choose a shape that doesn’t work well with your tub. Keep in mind that you want to find a bath pillow that has a design that provides plenty of support for your neck and head. Multi-panel designs offer more support and are more comfortable while solid, one-piece designs are good for supporting one particular area such as the back or neck. Budget considerations – Bath pillows come in a huge variety of price points. There are bath pillows for every budget so finding one to fit your needs while also fitting into your budget will not be an impossible task. Higher budgets will allow you to look through the higher quality bath pillows but you can still get a very good pillow even if you have a tighter budget. Just look for the different qualities we have listed in this guide to ensure you choose one that will last. Even an inexpensive bath pillow is not worth it if you have to replace them often. Fast Drying Material – Purchase a bath pillow that dries quickly to discourage the growth of mold and mildew. Mesh covered bath pillows will dry faster than terry cloth. Vinyl is the easiest to keep mold and mildew free and can be dried off easily with a washcloth or towel. Waterproof design – Make sure your bath pillow is waterproof. You may assume that a bath pillow would be automatically waterproof but some are made from materials that don’t dry as well or as fast. Drying the bath pillow between each use is very important. Vinyl is the most waterproof material you can get. Head and neck support – One of the purposes of a quality bath pillow is to allow you to relax in the tub with plenty of comfortable head and neck support. Leaning against the tub with your neck at an uncomfortable angle is not very conducive to a relaxing bath. The right bath pillow allows you to fully relax with the kind of support that eases your stress away. Taking showers is something that mostly everyone does on a daily basis to keep clean and keep their skin and hair healthy. Even though bath time as a kid is about getting clean and playing with bath tub toys when you’re an adult, bath time takes on a whole new meaning and purpose. Running a bath at the end of the day is something that can relax and refresh you after a day of stress or hectic activity. It is a terrific way to rejuvenate and get ready for the nighttime. Soaking in the tub for an hour with scented candles and a comfortable, properly supportive bath pillow can reduce back and neck pain, reduce your stress and help you have a wonderful night’s sleep too. With all of the different choices in bath pillows that are available you will be able to find one that suits your needs perfectly while providing you with the relaxing, enjoyable bath time you deserve. Each person will have specific needs that they will want to fulfill with the bath pillow they choose. Some bath time pillows are designed for those who just like to enjoy the occasional long bath and others are more luxurious and are designed for the one who needs some major de-stressing and relaxation. Whichever one you are, this guide will help you find the perfect pillow for you.